Decorative vases – these are used to cook rice and certain other dishes. A wicker basket is placed above to steam glutinous (sticky) rice, a staple of Southern Thailand. One of the jewels in NYC’s food scene is the cluster of Thai restaurants in central Queens, around Jackson Heights and East Elmhurst, at the confluence of the 7 and E/F subway lines. As in other regional centres around the city, whether Flushing (Chinese), or Coney Island (former USSR), there is a culinary infrastructure of markets, dry-goods shops, restaurants, and critically, old ladies keeping the eateries honest. Thai is of particular interest precisely because I’ve found it to be rare in Western cities – Thailand, unlike Vietnam and Cambodia, had a relatively peaceful twentieth-century. Nor was it substantially colonised. Hence there was less of a diaspora; the exodus that led to the awesome Vietnamese food of Paris, or the widespread, if often dubious, ‘Indian’ food in the UK. London has only a few decent Thai restaurants. Som Saa is run by non-Thais, but they, as so often, do a better job of it than natives. It had a fantastic energy when it was in the chaos of Climpson’s Arch, and I’m looking forward to their permanent digs. Nahm I never quite felt comfortable in, sweating bullets and hyperventilating always felt wrong in the expensively-bought serenity of Belgravia. 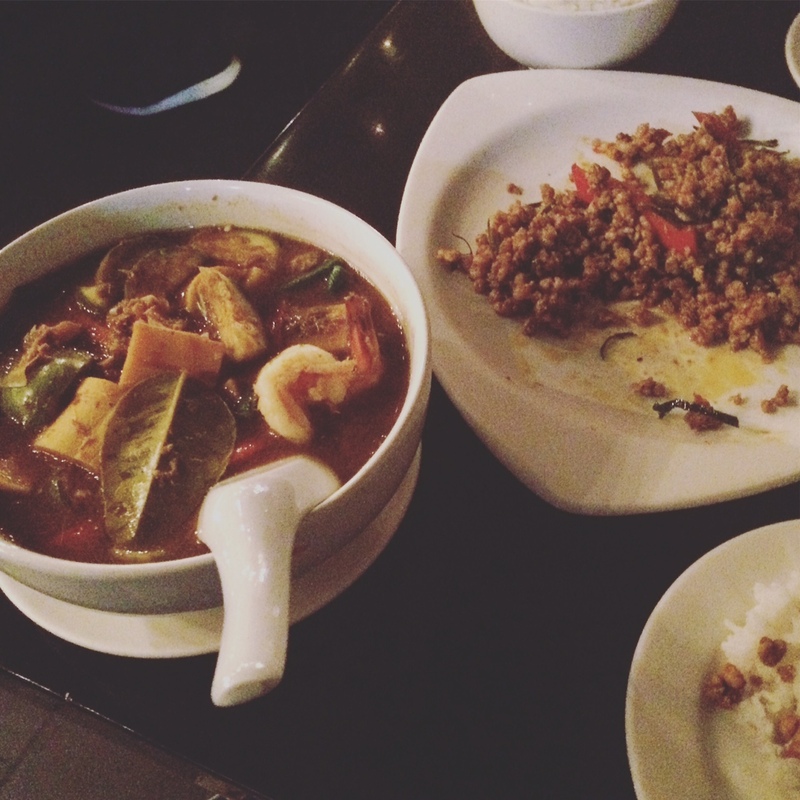 NYC’s Thai food scene hit the big-time with Andy Ricker’s Pok Pok Ny, which has great food. Personally, the pleasure sort of drops out of it when one sees the crowd – the Brooklyn/Manhattan food-tourism bunch, clutching their iPhones, seeking out the hottest new restaurant on Timeout. For my money (and it would be a lot cheaper than any of the above), I would head out to Queens. On a weekday one might see no crackers unimaginatively munching on pad-thai, there are actual Thai families feasting, there are almost entirely Thai staff in the kitchen, often supervised by a portly mama, and when one’s done, there’s the supermarket nearby to pick up kaffir-lime leaves and frozen krachai. This list is non-exhaustive, both in terms of restaurants and menus. Pick up David Thompson’s (aforementioned Nahm) Aharn Thai / Thai Food, it will tell more than you ever wanted to know about culture, history, traditions, ingredients, and recipes. The recipes are quite elaborate and few will follow them precisely, but they are useful as a canonical reference to be modified as ingredients, time, skill, and patience dictate. Unless otherwise mentioned, Thompson is a principal source of background material below. The book I actually use to cook is by Vatcharin Bhumichitr – a pragmatic volume that allows for shortcuts (for instance, taking a base red-curry paste, modifying it slightly to emulate other, similar, curry pastes). This is pretty awesome – a karaoke bar crossed with Thai restaurant, ironically next to the old Zabb space (below). Food is reliably spicy and a well-heeled Thai clientele, not dis-similar to Khao Kang, albeit a more comfortable space. As of Oct 2017, this feels like one of the top spots in Woodside/Jackson Heights. [Note Oct 2017: this review hasn’t been updated – but briefly, Zabb received a Michelin star in 2015 but has lost it in 2016, and seems to have changed ownership and name – the food is now merely okay, and mostly Isarn-style (Northeast)]. Isarn food has been trendy for a few years (Pok Pok Ny, Som Saa to some extent). The region is a plateau of 200m, and critically, near the great Mekong river, snaking along the border with Laos and Cambodia. Until recently, the land was densely wooded, inaccessible, and rural. The people of the region are a mix of Khmer and Lao, with the Thai being relative newcomers from the 10th-century. 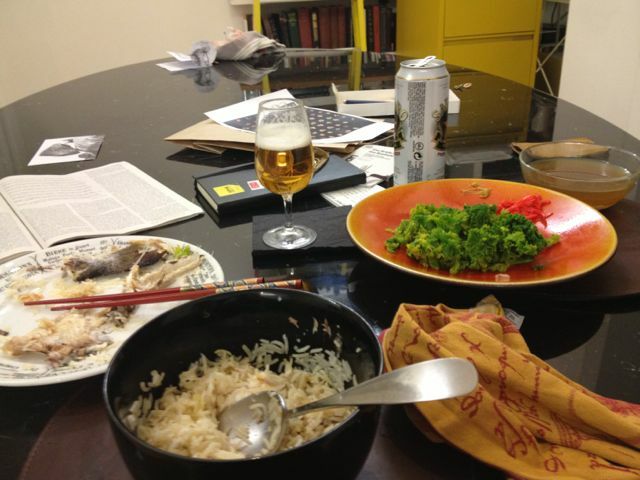 The land and people were poor, and the food pungent and spicy, so as to better relieve the monotony of white rice. Unlike the south, glutinous rice and coconuts are not features of the cuisine. Fermented fish (pla raa), raw minced meat salad (larp), a cornucopia of herbs, and grilling, as opposed to the elaborately cooked curries of Bangkok, are the norm here. One of the noodle soups at Zabb with basil, pickled mustard greens, a fish ball I think. On the side is the Lao salad with fermented fish and crabs, and pork rinds. My favourites on Zabb’s menu: the grilled Thai sausage is superb, redolent of lime leaves and ginger. The yellow curry with bamboo shoot was awesome – a curry with a base of fermented fish (not that one necessarily can tell, the fishiness has been tempered and balanced as so often in the Thai repertoire), and the delicious aroma of sheets of fresh bamboo shoots. Bamboo shoots are fiddly to prepare, so this is a great dish to eat out (as is the sausage). Naamya Pa and Pak Tai were both good. The Lao Soup was excellent – a darkish broth – very different from the other soups, perhaps meat-based – and, in a pleasant surprise, the chicken version was quite different from the catfish. A word on Southeast-Asian catfish – I believe these might be from the Mekong river – they are pretty bony, but eventually one works out the structure. Still, I don’t love them, but they contribute a lot of flavour. On the salad front, there was a sausage of raw and sliced pork sausage with papaya – it was interesting, funnily, though the sliced sausage reminded me of the gross hybrid of pate and baloney meat found in ‘authentic’ Vietnamese sandwiches. In a salad, however, somehow it worked. The Lao papaya salad with fermented fish and tiny purple preserved crabs was pretty good, but like many papaya salads, too sweet for me personally. The larp ironically, weren’t my favourite – I prefer to use lime leaves, lemongrass and loads of roasted rice – whereas Zabb’s were closer to Thompson’s canonical, simpler, version. Having said that, I had the catfish, and chicken, varieties, and both were great. They also have duck, beef, pork, pork liver, pork ear, crispy pork, and crispy fish – knock yourself out. While at Zabb, or probably on another day, check out the izakaya downstairs. Unrelated to the Thai restaurant, other than by name, the basement joint was started by a young Thai guy passionate about Japanese food. He has made a drinking den that could easily fit under the Yurakucho Arches at Tokyo Central. The Sapporo pitchers are super, as are the crazy, mayonnaise-and-eel sauce drenched rolls. This place, with the most insane nightclub interior, was admirably summed up by Robert Sietsema which I’ll struggle to outdo. But a bit more on the south of the country: there is a low-lying region near Bangkok and then the thin, hilly, monsoon-ridden Isthmus of Kra. Tourists may know this area as it is near Phuket and Samui, and it is much less isolated than Isarn. The people are split between Muslims and Buddhists, and the food has something in common with Malaysia and points to the south, influenced as they are by traders plying the sea-route from India. Apparently there are also some marginal ethnic communities, such as sea gypsies and pygmies in the dark forests. The food of the south is characterised by use of turmeric, coconut, and sour things like tamarind. 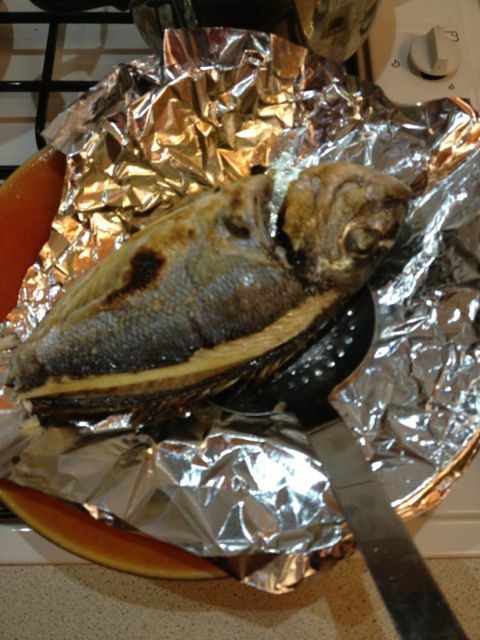 Unlike in the north, fish is much eaten, fresh as well as dried. Not surprisingly, cardamom, cumin, and ginger figure in the cuisine. Kitchen 79’s sweet staff freely admit that they mostly cater to non-Thai, given their location in the melting-pot that is Jackson Heights. Yet on weekdays at lunchtime, I see plenty of Thai eating there in little groups. The menu is forced to span all tastes, but I stuck with the stunning Gaeng Tai Pla curry, a brown curry from the south with vegetables and a base of (possibly fermented) mackerel and prawns. Another standout dish was the Kao Kling Moo, a southern dry curry paste with ground meat (I had chicken). This was one of the best Thai dishes I’ve had, ever. Both dishes are intense and spicy, and are much better shared with others. Kitchen 79’s version of a Southern curry with prawns & mackerel. Beside is the superb minced chicken in dry curry paste. A curry with catfish, though this one is from Zabb (so Northeastern) rather than Southern Thai (Kitchen 79). I’m a bit reluctant to post this one – it is tiny, a caff really. But it’s possibly the best of the lot, because of the variety on offer. One can see what’s freshly made that day, and try a few things. The clientele is almost 100% Thai, and young hip ones at that, but enough oldies come in to assure one that standards are being upheld. No one speaks English particularly well, which is reassuring. It was interesting to have reference dishes, such as the bamboo curry at Zabb Elee, here made with fish rather than prawns – I preferred this version frankly. There is also an astoundingly fishy curry here, seemingly made with fish head, smokily complex, intensely spicy, with either palm hearts or bamboo shoots in it – again, a must try. I find the eggs with pork belly in sweet brown sauce a perfect foil to the other spicy food, and any time they have vegetables, often simply sauteed with ginger and oyster sauce, I take those as well. Greens with prawns, again a very mild sauce, not much more perhaps than stock and ginger, oyster sauce. The other dish is ground pork with basil. Anytime bamboo shoots are available, grab with both hands. These are slivered shoots with prawns. Both Khao Kang and Zabb also make a curry with sheets of shoots, as it were. The food is very good here, with lovely service and the place is stylishly decorated. I don’t have a specific recommendation, but do recall an intensely spicy catfish curry with Thai globe aubergines and green peppercorns. My fondness for this place comes down to the owner, who ran a tiny takeaway in Hell’s Kitchen called Wondee Siam – this was where I first ate real Thai food in 1997 – before taking rooms in Bangkok’s Oriental Hotel, the doyenne of Asia’s grand hotels. I understand Wondee has perhaps changed, subject to the forces that are altering much of the formerly-deserted bits of Manhattan, but Paet Rio keeps the fire going, and boy, do you feel the burn…. This is notable as a grocery for ingredients, as well as a place to buy some prepared food, and particularly, tubs of various curries and dishes, that I happened to have seen at Khao Kang. Possibly they have the same owner. There are also sweets, if one likes Thai sweets (I’m not a particular fan). It is also a sort of clearing-house for advertisments, and a youth-club. One can also get a mortar and pestle, important for making Thai food; note however, this type (terracotta) is only suitable for making soft things like papaya salad. A curry paste is better made in a granite mortar, best ordered online. The Thai grocery on Woodside Ave near Ayada sells one, but it’s too large, pricey, and feels aimed at the Westerner slumming it in Queens. I have eaten at both, but to be honest, stuck with the more ‘particular’ places above. Both are very good, and were pioneers a few years back when there wasn’t that much Thai food in Queens, never mind NYC as a whole. Now they have become the best known Thai places and are mobbed by brunch-eaters from Manhattan and giggling Midwestern tourists. Probably weekday lunches are still good. This is supposed to be good, but I had a lunch-special dish there and didn’t particularly rate it. Perhaps it should be given another chance off the regular menu. My own take on a krachai-infused jungle curry, with pangasius (a type of intensively-farmed catfish available in boneless frozen fillets, inoffensive and utterly tasteless, complementary to most curry-type preparations. From Vietnam. The sauce just behind is lime juice, chili, garlic, and fresh chili – useful to pep up any dish). There are two I know of – one across from Sripraphai and another across from Ayada. Pok Pok Ny’s Andy Ricker seems to like both. I prefer the former – a very sweet owner, who took the time to tell me about restaurants in the area, the differences between various ingredients, and seemed to have fair prices. I picked up pickled mustard greens, lemongrass, and a few odds and ends. I would stay away from the Chinese supermarkets, if possible, for specific Thai ingredients: the green birds-eye chilis (so called ‘scuds’ by Thompson) were past their best and not remotely spicy, and the frozen galangal was water-logged. The supermarkets are fine for greens, but I’ve tended to go to Patel Brothers and Subzi Mandi in Jackson Heights – prices are good and stuff is fresh. Fish, prawns, etc. needless to say should only be bought in Manhattan (Chelsea Market’s The Lobster Place has great things mostly at fair prices, and I’m told the fishmonger Rainbo’s at Essex Street Market is good, at least better than the Chinese one in ESM). The Thai grocery across from SripPraPhai. The best place for dry, preserved and frozen ingredients. Don’t have greens or fresh fish/meat. David Chang, one of New York’s most prolific restauranteurs (the Momofuku stable), writing recently on the food blog/magazine Lucky Peach, waxed lyrically on about Tokyo’s food. Mostly good, and well-known, points, but a couple of comments are in order. I’ll excuse the gratuitous expletives and the overuse of the superlative ‘best’…maybe that’s intended for the hipster audience. His overall point, that Japan (specifically Tokyo) borrows magnificently from other food cultures, and lends out its aspiring chefs on secondment to top restaurants from Yountsville to Modena, is spot on. But I think the point can be driven deeper – the Japanese have a gift for internalising the culture of other countries, presumably more so in the post-WWII era than before, and to a certain extent, combining that with a highly-developed indigenous culture, to create a synthesis that, in style and quality of execution, isn’t matched anywhere else. The key words here are ‘internalising’ and ‘indigenous’. I don’t think they’re just copying the food – the chefs, but perhaps even the kids with crazy outfits in Harajuku, are looking at, and living, the culture, the music, the film, the clothing that they’re interested in, whether it be American, Italian or French. There is a passion (to use a hackneyed word) and depth to the research that shows through in the simulation, a stage set, that is a Tokyo restaurant. Equally, this painstaking simulation is not being dumped on a blank substrate – Japanese culture, and food, are obviously immensely developed, and years of low immigration have had the perverse effect of maintaining a certain purity in both cultural practice and practitioners. Your average person really gets their food culture, they’ve grown up with it, haven’t necessarily seen much else, or have only seen it through a Japanese cultural filter. So the French, Californian, or Italian food in Tokyo has a distinct Japanese imprint, if only in the attention to detail, the arrangement of the room, the handling of light and space, the exceptional quality of the ingredients (as Chang points out). Thus, the simulation becomes a simulacrum. Here I would characterise Chang’s comments on Italian food, if not French, as slightly ignorant and perceptive at the same time. Italian food does not just have to be pasta, as anyone who has spent time in, say, couscous-laden Trapani (Western Sicily) or rice-growing plains of Po Delta, can attest. But Italy does have a strong resistance to change, as well as an internal food culture that Italians feel, rightly so, is well worth preserving. But, here’s the difference with Japan: people, from what I can see without having interviewed hundreds, actually don’t want to eat much imported food. Even outside Italy, while one sees plenty of well-heeled Italians at ethnic street-food stalls in East London, but most Italian tourists pile into Soho’s Princi, which they know from Milan. Here, in my humble opinion, is the difference with New York and London – two other world cities with very good food. I would argue that neither America nor England have the same quality of indigenous food, that substrate, that Japan has. America, as a country so young and foundationally built on immigration, can have no ‘native’ food culture. So everything in New York is a simulation, for better or for worse. England perhaps had some interesting food before WWI and WWII, and in the last 20 years, chefs such as Fergus Henderson (St John in Clerkenwell is the best one of his) have done a heroic job resurrecting the old recipes, but again, it’s all (re)created: the average youngish Londoner seems, from my own anecdotal experience, to care more about what he/she drinks and smokes, and where, than the food. So both New York and London seem to produce copies, more or less acceptable, of foreign food. But their copies, particularly in London, are mass-produced, soul-less affairs, more reminiscent of an accountant’s spreadsheet, redolent of return-on-equity and price-points, than the work of single mad chef. New York is a bit better, but again, rising rents, the internet, the phenomenon of food as something one watches on a screen, have taken much of the fun out of the restaurant scene. There are plenty of exceptions, particularly outside of Manhattan – for instance, Sake Bar Zabb, an simulated izakaya , set in a poorly-ventilated basement in Jackson Heights, a neighbourhood in Queens previously only known for really bad Indian (i.e. Pakistani and Bangladeshi) food sitting in pools of fetid grease. Curiously, Zabb, which shares the name with an excellent Michelin-starred Thai restaurant upstairs, is run by an enthusiastic Thai man who has sourced hundreds of objects from Japan to create his little sarariman‘s drinking hole, complete with foaming pitchers of Sapporo and squishy raw octopus in grated horseradish. Moving on to a controversial point, in this most politically-correct of cities: the last difference I would point out between the New York restaurant scene and Tokyo’s, is the makeup of the cooking staff. Look around any good, but perhaps not top-end, restaurant in much of New York – most of the cooks are Hispanic, with a smattering of Bangladeshis, African-Americans, Chinese, etc. I can’t help thinking that the French or Italian food coming out of those kitchens must, in a majority of cases, necessarily be totally disconnected from the culture and experiences of the cooks making it. Surely, if food isn’t just something you put in your mouth, and is a cultural or communicative experience, the fact that the person cooking the food hasn’t grown up with it, or at least taken a multi-year deep interest in it, surely must detract from the ‘essence’ of what one is served. Unless Japan has changed in the 5 years since I last was there, most of the cooks are Japanese, and the Japanese chefs have often spent years in Western kitchens learning about food they’re cooking and the context it exists in. I’m sure some will object to these comments, but the fact that restauranteurs such as Danny Meyer and Andrew Tarlow are moving over to a no-tip policy could lend some support to my view: the extortionate tips in New York only go to front-of-house staff. This means that the cooks, the people who obviously matter more, are being paid much less than the decorative foliage swanning around the dining room, their fawning equal parts strafottenza and passive-aggression. I would end by pointing out some of the finest, most interesting, most passionate (again that word) food in New York still comes from the kitchens that are family-run, or at least held firmly within a given ethnic group: the sushi bars (Hibino in LIC is a fave), the absolutely stonking Thai joints in East Elmhurst/Woodside (start with Zabb Elee, Kitchen 79, Khao Kang, & Paet Rio), the filthy but delicious regional Chinese stalls of the Golden Mall in Flushing, or that joyous margarita-meat-and-arepa extravaganza that is the Colombian restaurant Delicias in Woodhaven. Saba nitsuke is an exquisite little simmered-dish (nimono) that benefits from top-quality mackerel (we get ours from Fin & Flounder in Broadway Market and, touch wood, haven’t had a Sancho Panza-style gushing-from-both-ends bout of food poisoning yet). Scale, gut and wash 2 mackerel, or get the fishmonger to do it (ideally they take out the little “pin” or “fin” bones but it doesn’t matter as they’re not terribly hard). This recipe is sized for about 400g of mackerel fillets. Heat about 175ml of cooking sake in a pan slightly deeper than the one in these pictures, yet wide enough to take the fillets. 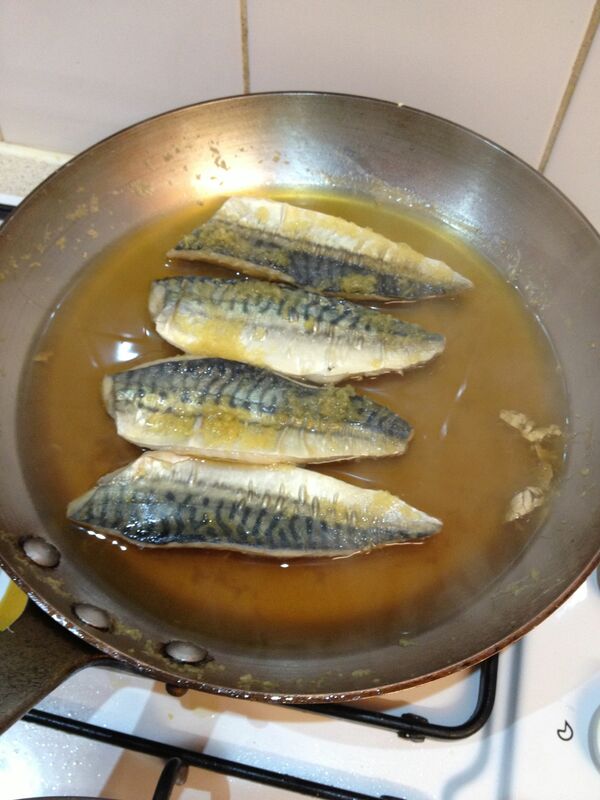 When simmering, place the mackerel skin-side up. Turn up the heat to a rapid boil. Add 100ml of mirin, and let it get back to a boil. Add 80ml of soy sauce, again let it boil. Finally grate 30ml of ginger over the fish, and a tiny amount of sugar. 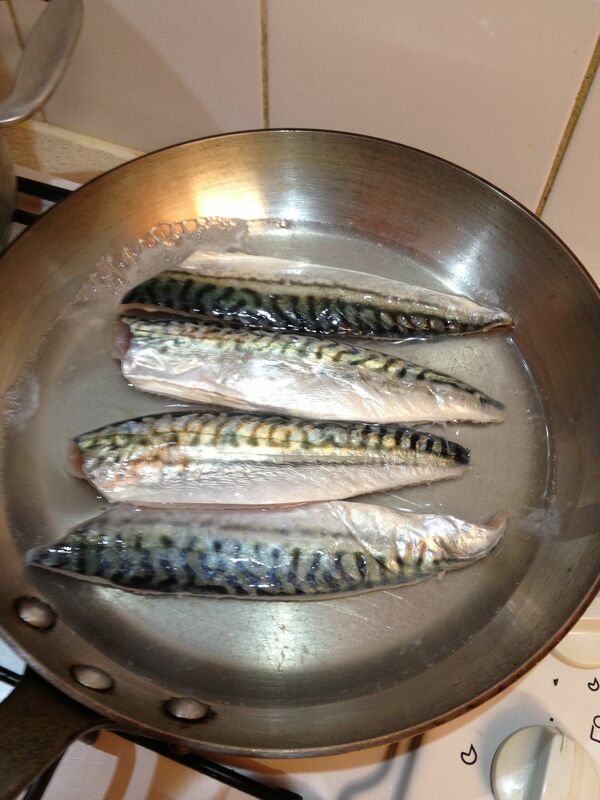 This “staggered boiling” process is what gets rid of any fishy odour the mackerel might have. 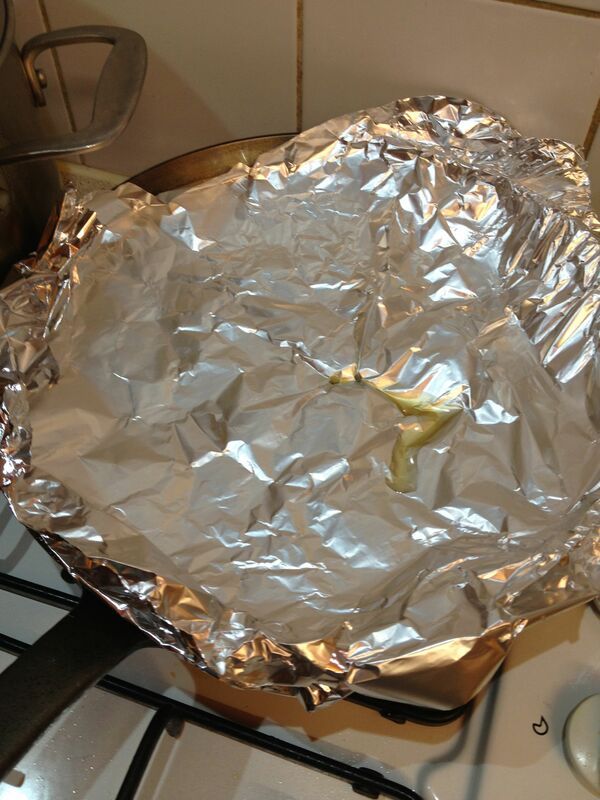 Now put on a “drop-lid” (otoshi-buta) or (since they’re hard to find) simply a piece of foil with a hole in the middle, that fits into the pot reasonably well (hence I’d suggest a pot slightly deeper than the one I used, as the liquid tends to boil over). This allows for the fish to cook briskly, without the movement that would cause it to break up. Cook on high heat for 8-10 minutes, check for doneness, and serve hot. The dish tends to be quite strongly flavoured / salty, so it’s good to serve with steamed white rice and simple boiled spinach. A splendid little summer starter…the miso glaze enriches the scallops, while the ginger and yuzu dressing cuts through that richness. 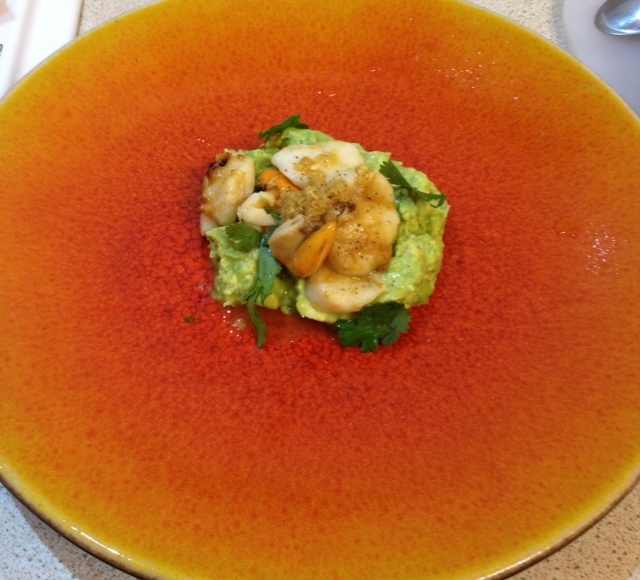 The avocado fills the dish out a bit and adds colour, but is optional. This would probably work pretty well with daikon radish shavings, or on its own. BTW, this doesn’t imply a Japanese main course: had this as a starter to pasta in crab sauce, followed by grilled steak with salsa verde. Mash up an avocado’s flesh, add a little lime juice, salt and pepper. Set aside. Make a marinade of 1cm ginger, 2 tbsp soy sauce, 1 tsp sesame oil, sugar to taste. Add yuzu rind if you have it, but I couldn’t find any, so used a yuzu liquid concentrate that, while not comparable to the real thing, doesn’t have any obvious chemical taste and apparently lasts okay in the fridge for a few weeks. I shouldn’t add too much, a hint of yuzu is enchanting while too much (bottled especially) reminds me of that habit nasty Italian restaurants had, in the 90s in London especially, of drizzling truffle oil on everything. Put a drop of oil or butter in a pan (or on foil), smear a little red miso paste onto the scallops, and place on the hot pan (or under the grill). Sear/grill, turn over, same on the other side, leaving the middle translucent. Remove scallops onto hot plate, put marinade into the pan (if used) and heat briefly. Place scallops on avocado puree, drizzle on the marinade. Garnish with coriander leaves or sesame seeds or kinome sprigs. 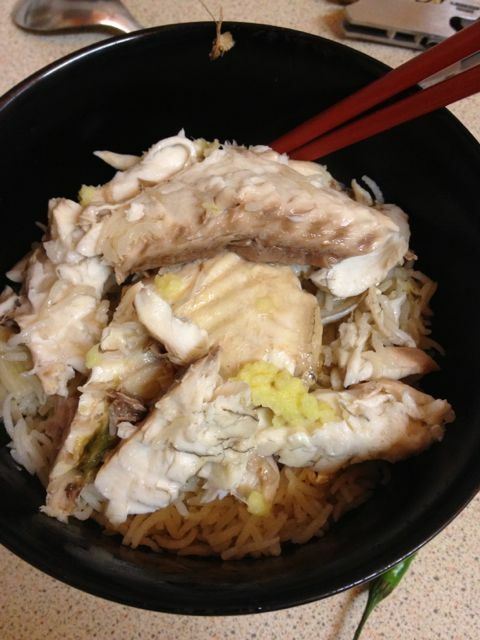 A fantastic, and (relatively) easy dish: the rice cooks in the juices, particularly from the skull, of a gilt-head bream. 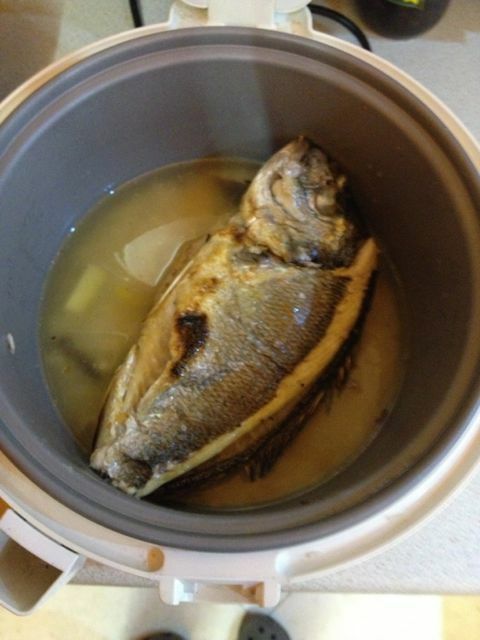 Ideally one would have an earthenware donabe casserole, but a rice cooker is just fine. Very clean flavours of fish and rice, with lots of umami coming from the dashi, and as little or much salt as one wants. Use the extra dashi to boil some vegetables or make a soup. 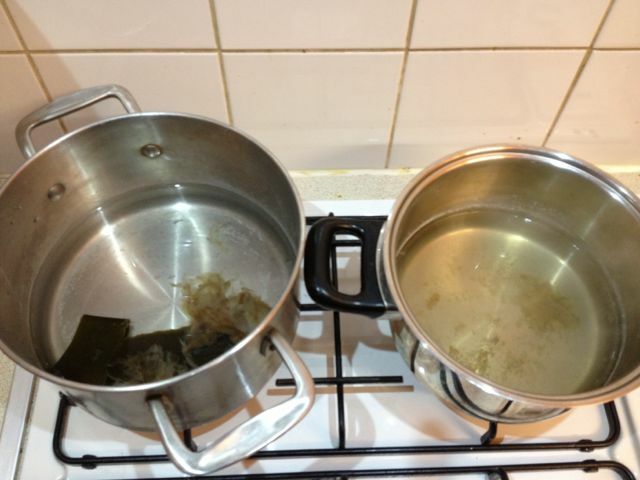 Make a dashi (see my post on oden for a detailed recipe): a piece of kombu in cold water, brought to just below a boil, at which point the kombu is removed. Once the water is boiling, turn off the heat, and add a little cold water to cool the broth down. Add bonito flakes, and turn heat back on. Just before it boils, cut the heat and remove the flakes immediately (neither the bonito nor the dash should be allowed to boil). Strain out the flakes (the used kombu and bonito flakes may be used for a secondary brewing of dashi, though this tends to be a stronger broth that is reduced and used for sauces or simmered dishes). Set dashi aside. 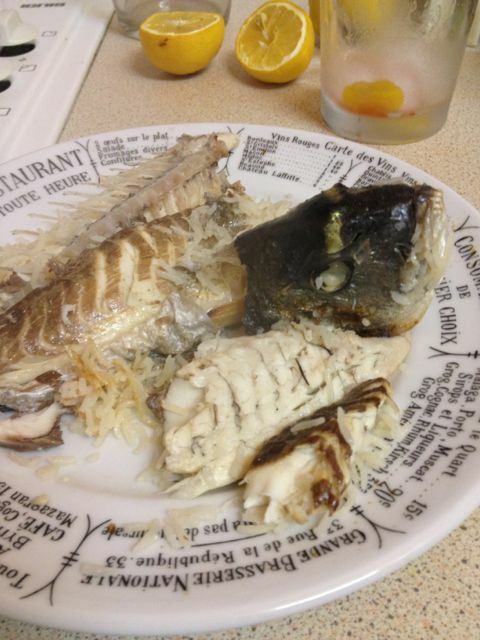 The bream should’ve been cleaned and scaled, with head and tail intact. Turn on oven grill, or a real grill if you have one. If using a real grill, skewer the fish appropriately so it doesn’t break apart. Assuming you’re using an oven, lightly salt both sides of the fish, and grill for 8-9 minutes a side. It should blister, crackle and hiss terrifically. Meanwhile, wash the rice, place in the cooker and cover with dashi. Add some soy sauce (for 1 cup of rice, I use 1/2 tablespoon of “light” soy sauce, which is actually saltier than normal soy sauce; also it is not to be confused with “low sodium” soy sauce), a pinch of normal salt, and a tiny splash of mirin. I also add a few slices of ginger root which is not canonical but freshens the dish a bit. Must have for any kitchen (that makes Indian or Japanese food). 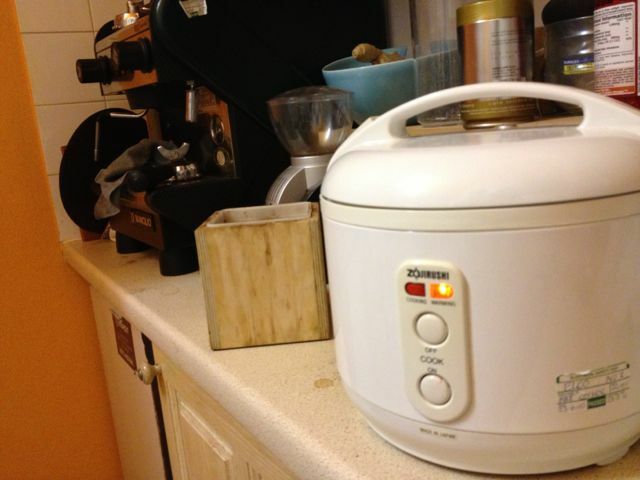 Zojirushi rice cooker. Teflon lining makes cleaning a snap. 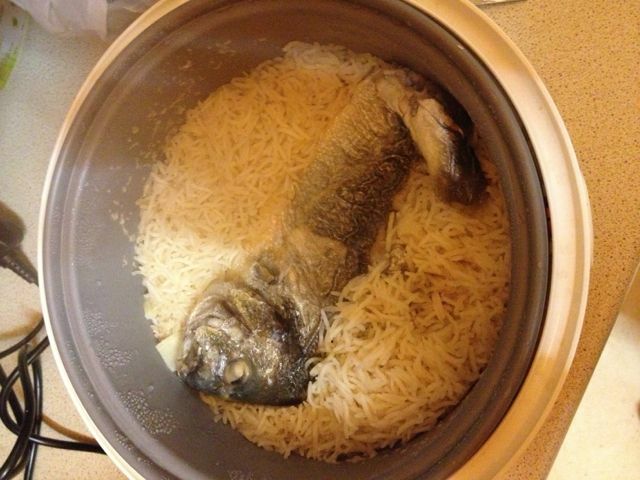 Cook the rice per instructions of the rice cooker, open up, remove the fish carefully and separate flesh from bones with chopsticks. Put the flesh back into the rice vessel, and mix in. Perhaps grate some ginger on top, and serve immediately. The, late, gilt head bream. Noticeably maudlin. Dinner. Greens have been boiled in dashi, which is served separately as a soup.